Bunty and I are in Morocco. 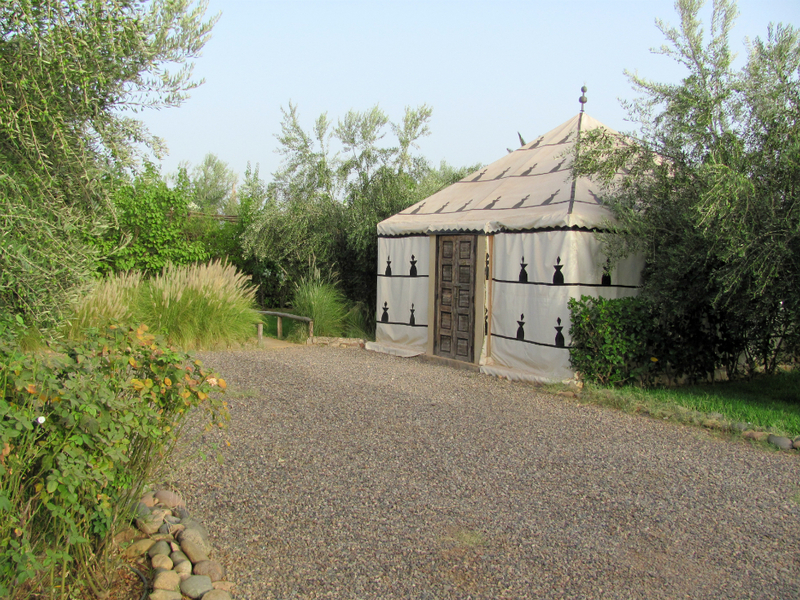 Last night, we slept in a tent surrounded by fruit trees and palms and jasmine, and crickets and stars. 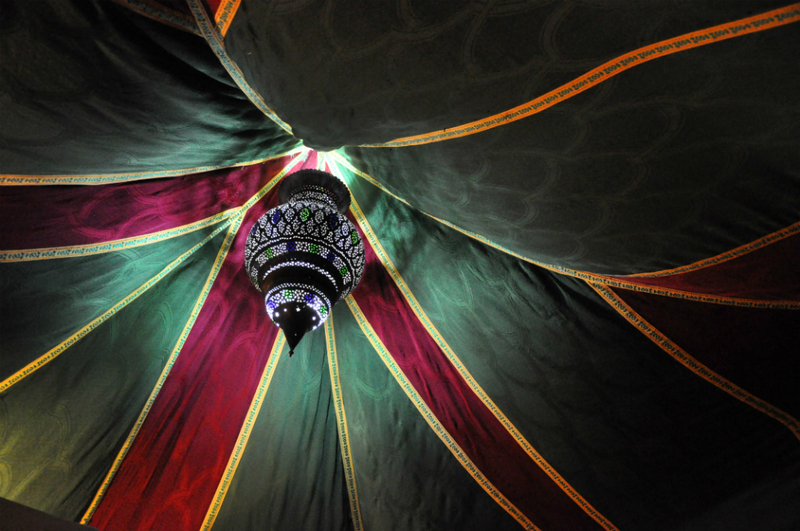 The tent stands in a garden called Manzil la Tortue – the Secret of the Tortoise. We now understand what makes it secret. To find it, we drove along a long, long dirt track, past tiny hamlets of ramshackle houses where all the villagers were sitting out under the stars at their Ramadan feasts. Fearing we were lost, we stopped at a shop the size of a wardrobe, and I got out of the car and asked the three men outside its door for directions. They spoke no English and I had not managed to bone up on French or Arabic, but somehow, with a lot of laughter and a hastily-sketched map, we managed to communicate with each other. I awoke bright and early, having slept through the muezzin’s call to prayer that woke Bunty in the dark hours. The air was still fresh and laden with jasmine, and I wandered out to explore the grounds. I found three different species of ant, an array of pill bugs, a fly, and three species of songbird. A man raking flower-heads out of the pool greeted me. I was bonjoured soon afterward by the camp site guard, a man wearing the long djellaba and pointed yellow slippers seen all over Morocco; and a woman, also in a djellaba, who passed me in a covered avenue of white bougainvillea. A bee the size of a quail egg buzzed around my purple tunic. It was black and white and red – very striking – but it didn’t stay still for long enough for me to phtograph it. 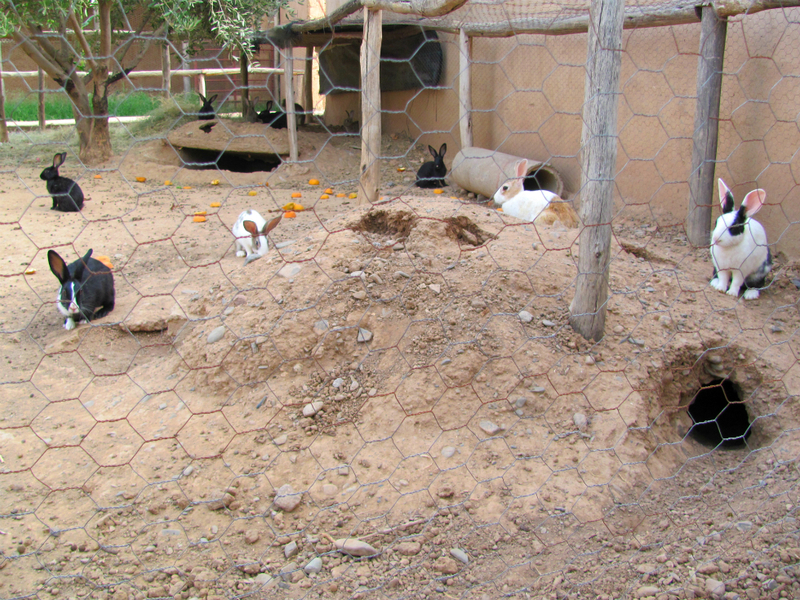 I rounded a corner and found this rabbit enclosure. I love that they are free to dig and socialise, and have burrows. I was surprised to see that they had been given a large number of orange halves to feed on, and had clearly appreciated them very much. I must try Broccles with an orange one sunny day. 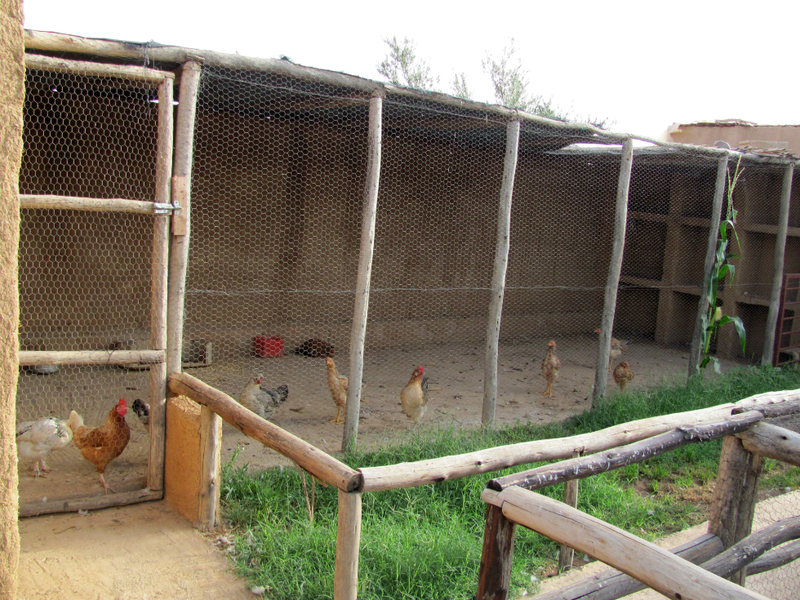 Then I stumbled upon the chooks who will be providing my breakfast eggs a few minutes from now. They look alert and happy too. No battery hens, these. The recent spate of hot weather has been warming the flagstones of our patio, inviting the cats to bask on them. 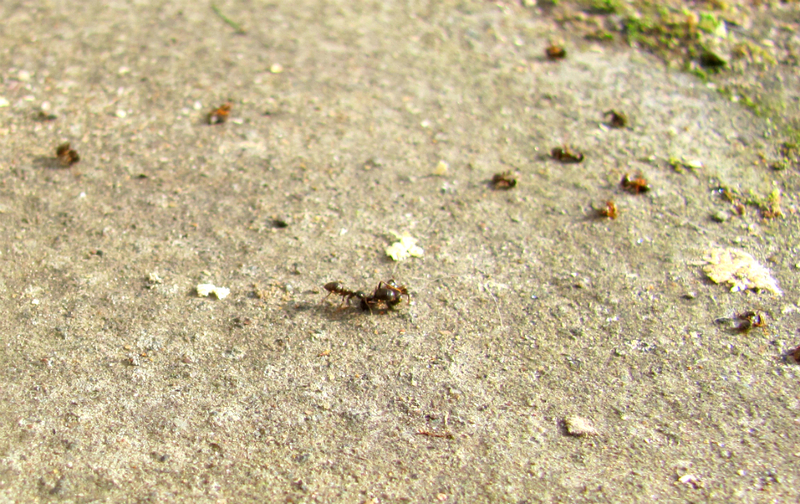 The black garden ants whose nests lie in the cracks between the stones have warmed up too, and begun to swarm. These winged beasties spilling out of the ground are virgin queens and their mates, preparing for the founding of new nests. The swarming lasts for perhaps half an hour, as nest after nest across the patio erupts into flight. They are ungainly fliers, so they climb to the highest point they can before taking off. This upturned dog bed, which the guinea pigs use as a shelter, became an impromptu launch pad. Bunty and I stood in the middle of the patio, watching them taking to the air in their hundreds, their wings catching the sunlight as they sailed over the garden wall, over the thistledown and away across the field. Many careened into us or got caught in my hair, and we coaxed them onto our fingers, from whose tips they launched themselves again. 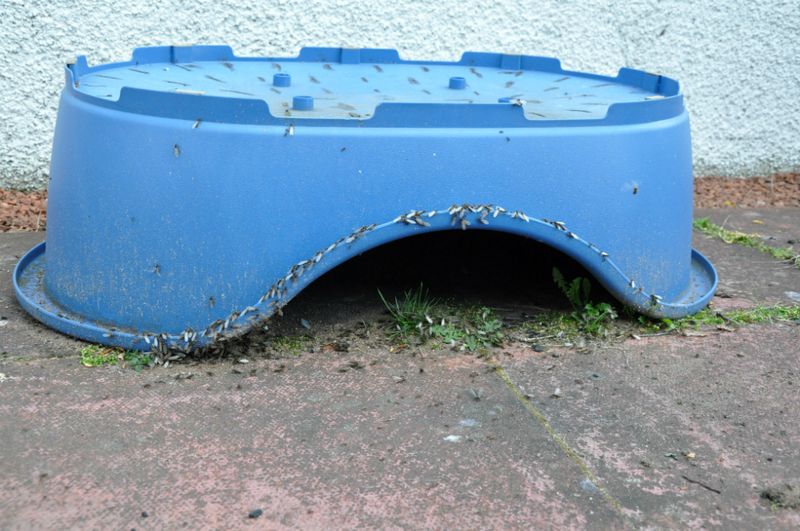 We couldn’t close the back door for a while, because a parade of ants was marching up the frame to take off from the lintel. It so happened that this very day, I had finished making a nest from plaster of paris for Betty, a gravid queen I had found wandering in the garden last year. She had over-wintered in a test tube on our mantelpiece, laying and nurturing her eggs until they hatched in April. Now her tiny colony is large enough to be transplanted. 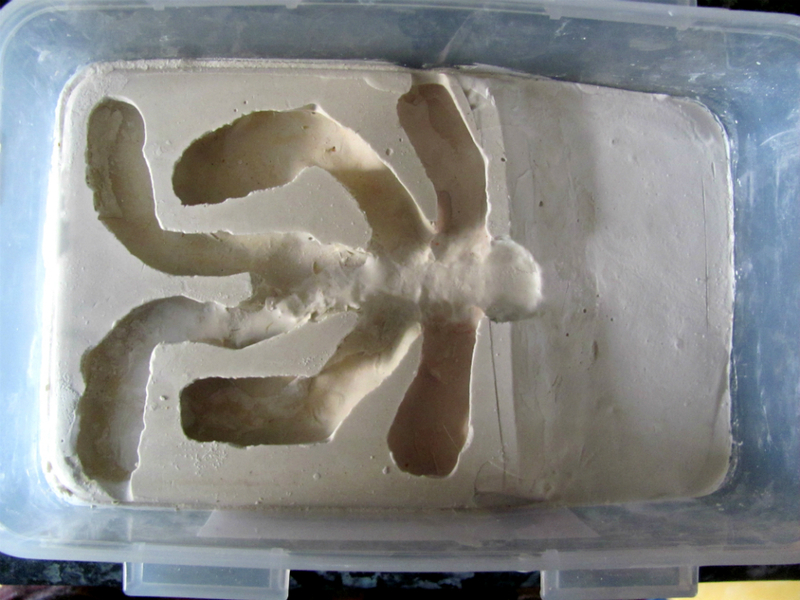 I based the design of the tunnels on a cast of a real ants’ nest I had once seen. Here is the nest without its lightproof lid. 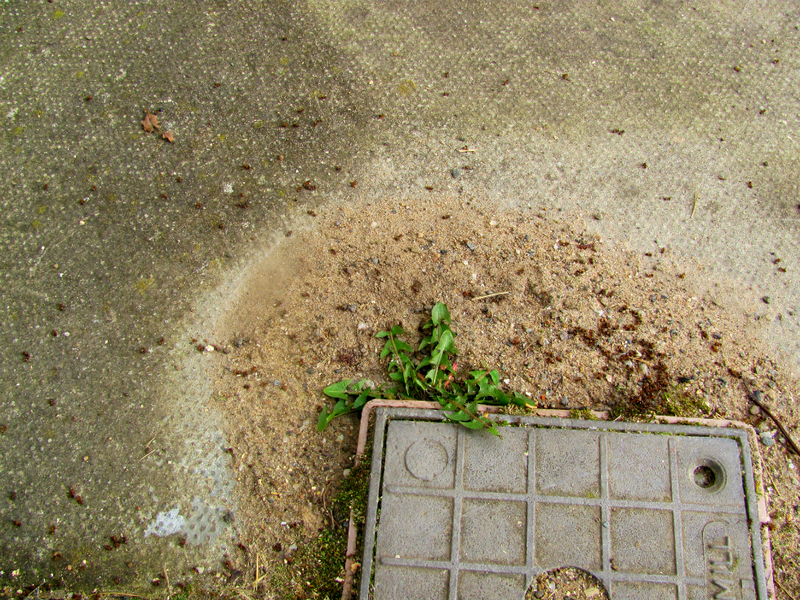 The smooth area to the right is where the ants can emerge to forage. I gently tipped my colony onto the entrance of their new nest. 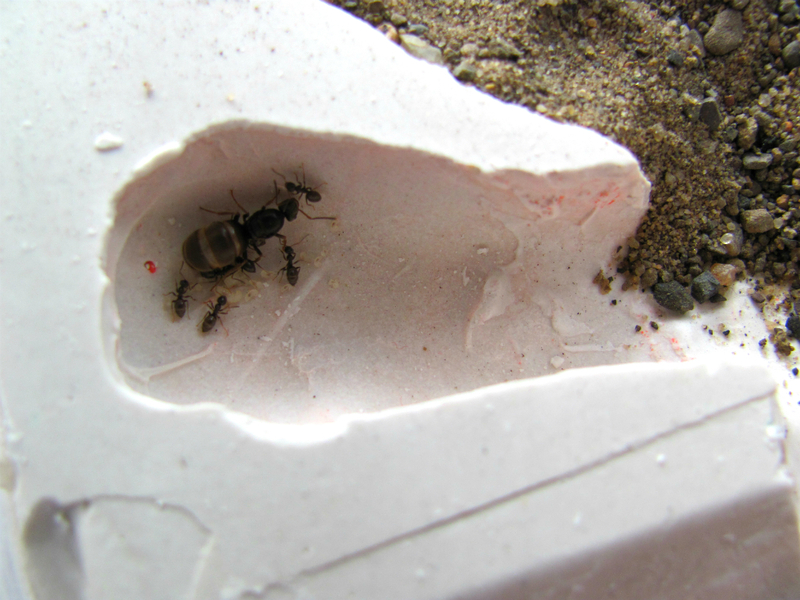 Queen Betty entered and chose a chamber, and her workers carried the eggs in after her. 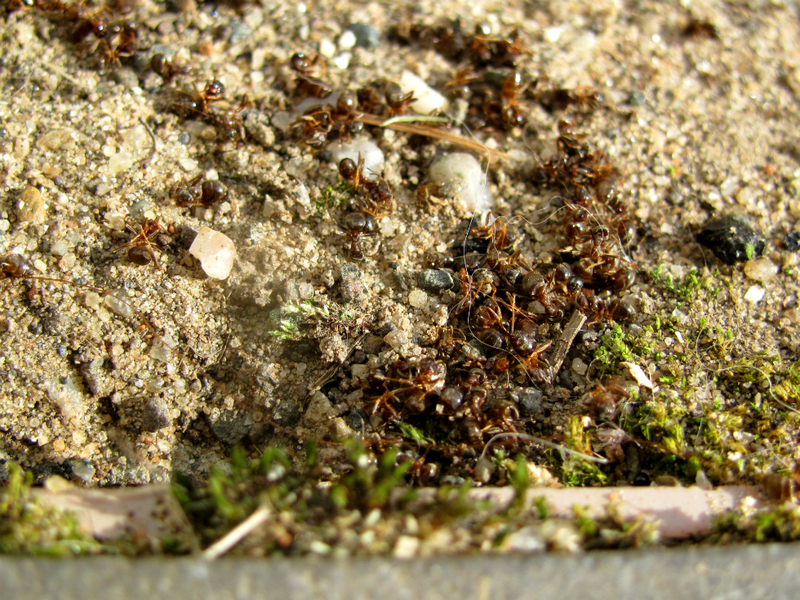 I filled the remaining chambers with sand, for the ants to excavate as their colony grows. Ants are my favourite animal. It makes me sad to think about the panic that people go into when they see Lasius niger, ants like Betty, preparing for their mating flights. They see the swarms and think the nests are getting out of hand and will remain as swarms unless boiling water or bleach is poured into them. Those poor creatures cause such little harm, yet are so reviled. She had been lifted onto a chapel wall along with some other children, to watch a demonstration and brass band passing by. Some ants had a nest up there. As the ants attacked and the band marched along the road, the children’s cries for help were drowned out by music and cheering crowds. 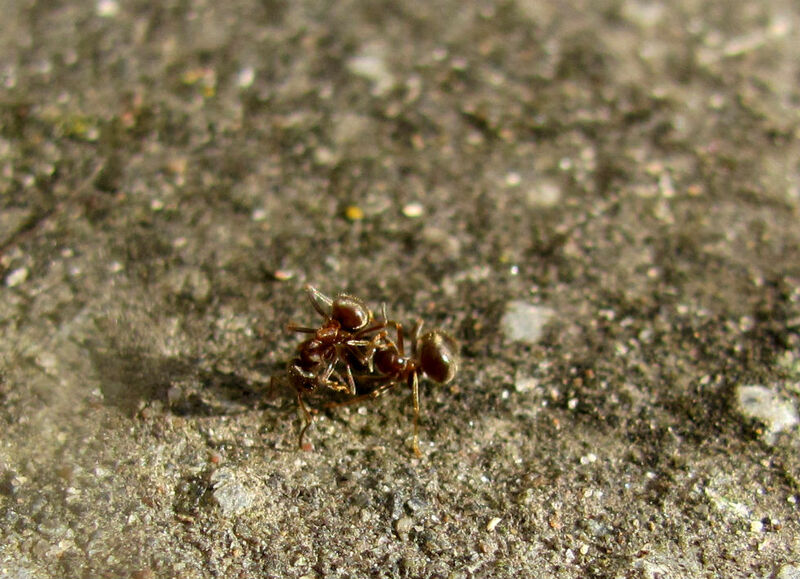 It was only fair that the ants defend their nest against that sudden disturbance. Wouldn’t you do the same? I don’t think my grandmother holds any grudges. 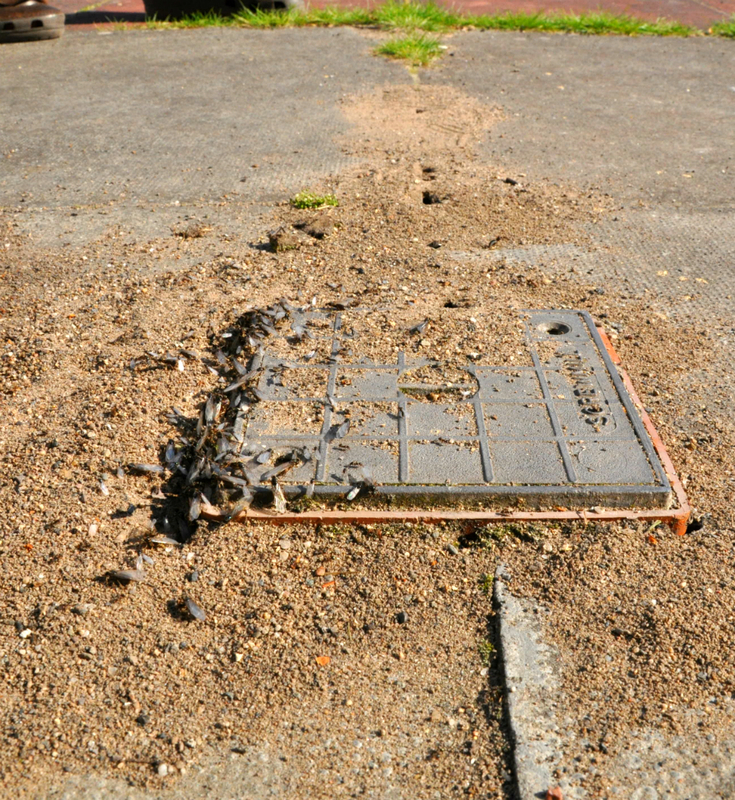 Besides – those were red ants. Not Lasius niger. Not my Betty.